Jeff Haynes/AP Images for PaniniBuccaneers defensive end Noah Spence wanted to bulk up to become a more complete player, and took on a massive diet during the offseason to do it. Tampa Bay Buccaneers defensive end Noah Spence reportedly gained 35 pounds over the offseason with the help of a strict diet. Spence’s intake includes nine meals and approximately 9,000 calories a day, helping him bulk up to become a more effective run-stopper. While the diet looks to have worked, Spence concedes that the routine has changed his relationship with food since beginning the regimen. 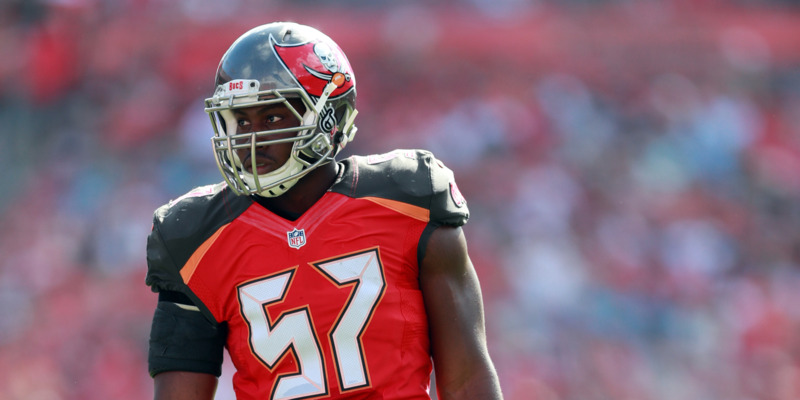 Tampa Bay Buccaneers defensive end Noah Spence has been taking his offseason diet seriously. As ESPN’s Jenna Laine reports, Spence came into training camp this year an impressive 35 pounds heavier than last season, thanks to a diet that consisted of nine meals and approximately 9,000 calories a day. While adding 35 pounds would not be ideal for many players in the NFL, for Spence, who reported to camp last year at just 228 pounds, the bulk-up should make him a much more versatile defender. Defensive line coach Brentson Buckner seemed pleased with the progress Spence had made, noting that his extra size will help him develop as a run-stopper. Two protein shakes made with vegan protein powder, peanut butter, a banana, and sugar-free coconut-milk ice cream before leaving the house. Cream of wheat with almond milk and brown sugar, three pieces of french toast, and two scoops of potatoes before practice. Two more protein shakes in the locker room after practice. Meal from the team chef in the cafeteria. First personalised meal from Lovell – example: 500 grams of pasta with six ounces of turkey, peppers, and onions in sauce. Two more protein shakes after team walk-through. Second personalised meal from Lovell – example: Six-ounce steak, four ounces of shrimp, with 500 grams of potatoes, zucchini, and squash. Peanut butter and jelly sandwich with a glass of chocolate almond milk in the evening. One final protein shake before bed. The laser-like focus of the diet has helped Spence put on weight while keeping his speed off the snap, but he admits that the strict relationship with his calorie count hasn’t been easy.